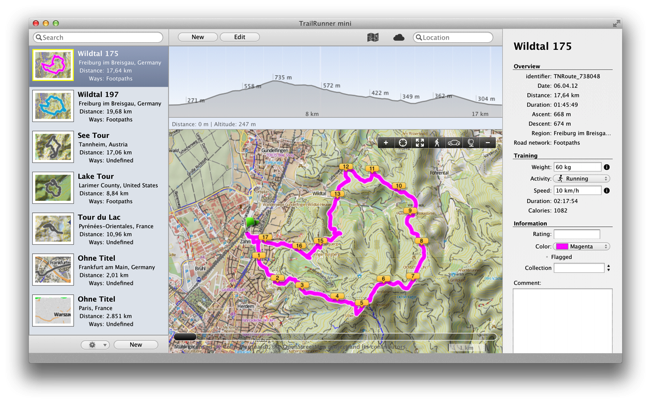 TrailRunner has a small brother called TrailRunner mini that is available on the Mac App Store. If you are accustomed to TrailRunner, TrailRunner mini is just the openStreetMap based route planner -- no diary, no GPS import interfaces -- but can import files in the gpx, tcx, pwx and kml file formats! In addition TrailRunner mini can automatically synchronize routes created and published by TrailRunner touch for the iPad or other instances of TrailRunner and TrailRunner mini (possibly running on a different machine, or to be more precise: can import routes from your dropbox). Should I buy both versions? If you consider yourself an expert routing freak with a GPS on your wrist, use TrailRunner 3. If you find TrailRunner 3 too complicated or bloated and you're only in need of a decent and simple to use route planner, go with TrailRunner mini. In the end -- it depends on your personal bias between simplicity and features. TrailRunner touch is almost identical to TrailRunner mini, except that it's tailored for the iPad and the touch interface. As both support dropbox syncing, both apps can have a shared route database. What app do you recommend for the iPhone? The closest relative of TrailRunner mini and TrailRunner touch is RaceBunny for the iPhone. RaceBunny is really simple. RaceBunny can record your trips and can import routes created in TrailRunner, TrailRunner mini or TrailRunner touch and display them as colored background routes. So basically you plan a tour in either of the other Apps publish them to your shared dropbox route database and then display them as background routes in RaceBunny. Alternatively there's Trails for the iPhone developed by Felix Lamureux. Trails is probably the best GPS recorder for the iPhone. Trails can send recordings via Wifi to TrailRunner but not TrailRunner mini. Alternatively you can send emails out of Trails to any of your devices and import the attached GPX file into TrailRunner mini, TrailRunner touch or even RaceBunny. Why is TrailRunner 3 free/donation-ware while the other Apps are not? I started all this with TrailRunner and it's for historical reasons that TrailRunner 3 is donation-ware. As TrailRunner 3 is rather complicated to use, I chose to rewrite the heart of it for TrailRunner mini. The younger sibling is much easier to use and has far less features. But in an amount and complexity I can easily support and extend in the future. Something I can't do for every aspect of Trailrunner 3. Therefore TrailRunner 3 still is donation-ware while TrailRunner mini is more or less commercial software. I develop all this stuff in my spare time. That's crazy, I know. So whatever app you use, have fun with them, let me know what you think and please understand that in the end -- it is the money I make with them what gives me the motivation to stick with it. (1) TrailRunner mini and TrailRunner touch use a very fast and modern routing engine, compared to the routing engine of TrailRunner 3.